From the classroom to the construction site, gender equality is central to buildOn’s global mission. As a community constructs a buildOn school, you’re just as likely to see women among the corps of volunteers—digging foundations, making bricks and mixing cement—as you are men. 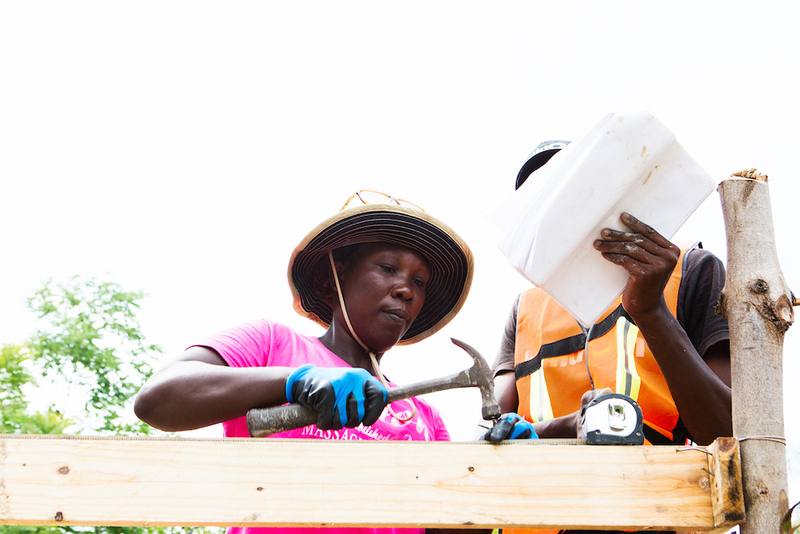 Recently, buildOn Haiti began taking female empowerment a step further by training Haitian women to join our staff of skilled building professionals who direct volunteers and perform the jobs that most community members lack training to perform. This means Haitian women like Julnie Genois can not only contribute to, but truly lead construction of buildOn schools. After studying masonry for two years and completing an additional year of on-the-job-training, Julnie discovered that her parents were right—despite all of her education and training, people didn’t want to give her work. Because she was a woman, men assumed she didn’t have adequate masonry skills. Julnie struggled to find work for a full year. One day in September 2015, Julnie was doing laundry when her cousin told her about a construction project happening in the nearby village of Valere. Not wanting to miss out on an opportunity, Julnie grabbed her tools and left for the neighboring village. What she found upon arriving was unbelievable to her—buildOn was leading a team of skilled laborers and community members to build a school, and they were encouraging women to take part in the construction process. The women on the construction site weren’t just fetching water or doing menial tasks—they were actually being invited to learn real construction skills. Struggling to find work as a skilled mason, Julnie heard about a buildOn construction project in the village of Valere and wasted no time in traveling to Valere to learn more. 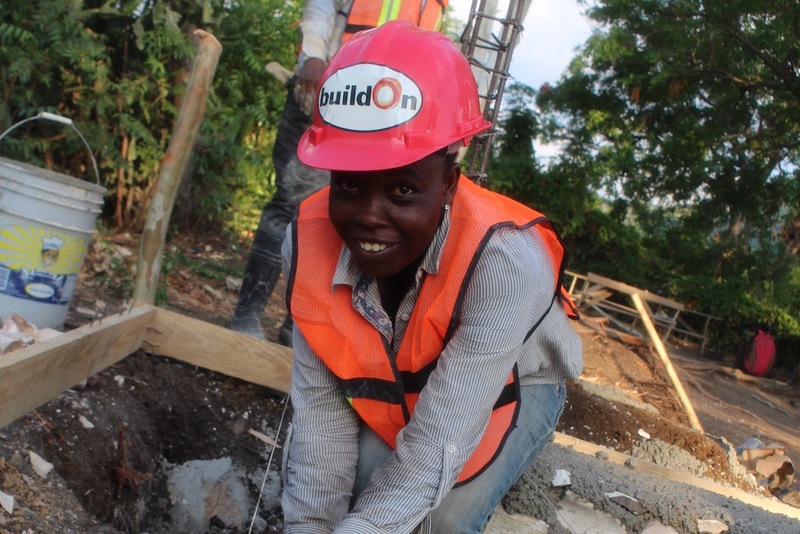 After volunteering for three months and improving her skills at the school building project, she was hired by buildOn as a skilled laborer and worked to build two additional schools before being placed on the construction team to build a school in Baptiste in December 2016. The Baptiste school was a special project for buildOn. Recognizing the incredible contributions and leadership of the female members of our movement based in the U.S., buildOn and our partner In a Perfect World challenged these women to take the lead in raising critical funds to support the education of women and girls in developing countries. The top contributors to the campaign formed an all-female Trek team that traveled to Haiti to work alongside a skilled labor team made up completely of women. 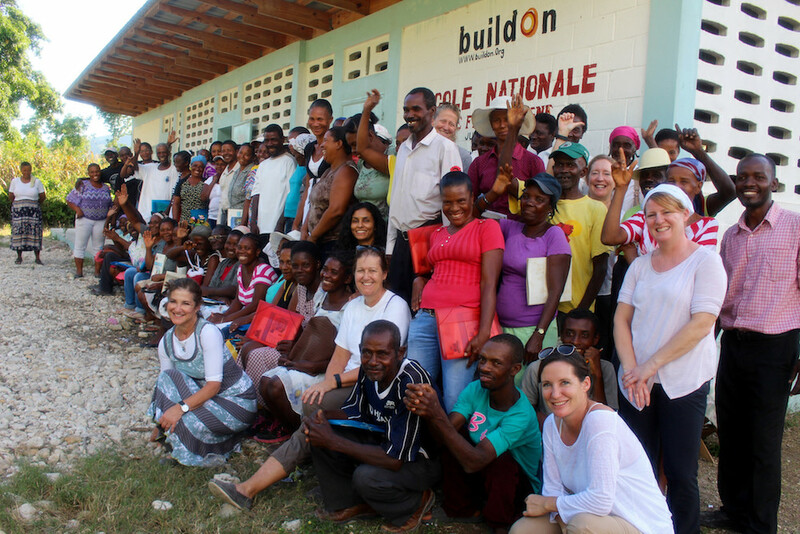 Lori Bush (bottom left) and the rest of the Trek team pose for a picture with community members outside a buildOn school in Haiti. Julnie was also happy to be in the community of Baptiste, as she saw how the members of the all-female crew served as role models for the women and girls in the community. She held both formal and informal meetings with them and encouraged the women to get involved on the worksite.